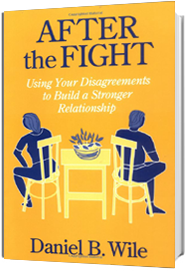 Workshop Title: Collaborative Couple Therapy: Turning Fights into Intimate Conversations. 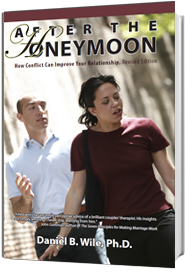 In this workshop, recorded on June 16, 2007 in San Francisco, Dan shows how to create an intimate conversation by bringing out the haunting feelings that each partner struggles with alone. 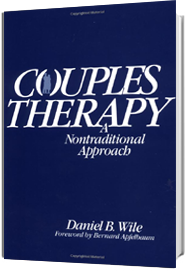 In the process, he provides a glimpse into the inner life of the couple therapist. Video: Therapy session with a real couple. Once these partners shift to a collaborative mode, they show an amazing ability to tune into each other and provide a model for how to have a relationship. Role Play 2: A husband’s hidden fear of being uncared for and a wife’s hidden fear of not being heard and of being alone in the world. Audio CD (in MP3 Format). Included are all the lectures, the role-plays, and the videotape (excluded only is the therapist’s inner dialogue skit). Shipping included in purchase cost. Please allow one to two weeks for shipping. In this DVD, Dan begins with a brief description of his approach, conducts the session, and then reviews what happened. At two places in the interview, there is background buzz (noise from the street). Otherwise it is a crisp recording. This DVD was recorded in 2005 and is session 9 in the series Psychotherapy Live, prepared by the California Institute of Integral Studies, produced by Philip Brooks, and filmed and edited by Travis Mathews. Included in the series are DVDs of a number of different therapists demonstrating various forms of psychotherapy. Shipping included in purchase cost.